Yesterday, the U.S. Department of Agriculture’s National Agricultural Statistics Service (NASS) released their latest Crop Production report. For historic context with respect to corn production, see this graph; for soybeans, click here. For a historic look at prices, click here (corn), here (soybeans) and here (wheat). As for the supply estimates impact on futures prices, Associated Press writer Lauren Villagran reported yesterday that, “Wheat prices climbed sharply on expectations for dwindling U.S. stockpiles before giving back the gains in a late-day tumble to the market limit. The Agriculture Department projected Wednesday that U.S. stockpiles will shrink to 33-year lows by the end of the crop year. Energy prices, particularly crude oil prices, have also been making news. And David Bird, writing yesterday afternoon at The Wall Street Journal Online indicated that, “Crude-oil futures prices traded to a record intraday high of $80.18 a barrel Wednesday as a tropical storm loomed off the U.S. Gulf Coast refining region amid fresh indications of tight U.S. oil inventories. Production estimates, the market prices of commodities, and the market price of oil, are among the factors that can play a role in ethanol profitability and future ethanol production levels. A Dow Jones news article from yesterday reported that, “The U.S.’ ethanol production capacity will probably total 20.43 billion gallons as of August 2009, up sharply from 6.707 billion gallons as of August this year, due to high profit forecasts and government support, a U.S. commodity risk management consultancy firm said Wednesday. “That means corn consumption for ethanol will total 7.46 billion bushels in the 2009-10 crop year, more than double the 3.62 billion bushels in 2007-08, Bill Tierney, executive vice president of research and marketing for John Stewart & Associates, said during the International Corn Industry Conference in Dalian. In addition, even as the price of crude oil soars to record levels, the price of ethanol for the first seven months of this year ($2.35) is averaging $0.23 less than last year’s average price ($2.58). One of the most important variables influencing ethanol production is U.S. energy policy. As concerns regarding overcapacity percolate, attention on potential changes in the Renewable Fuel Standard, as well as tax incentives for renewable energy production, will likely heighten. A Congressional Research Service (CRS) report from August (“Biofuels Provisions in H.R. 3221 and H.R. 6:A Side-by-Side Comparison”), which was written by Brent D. Yacobucci, provided a helpful guide to potential changes in U.S. energy policy. 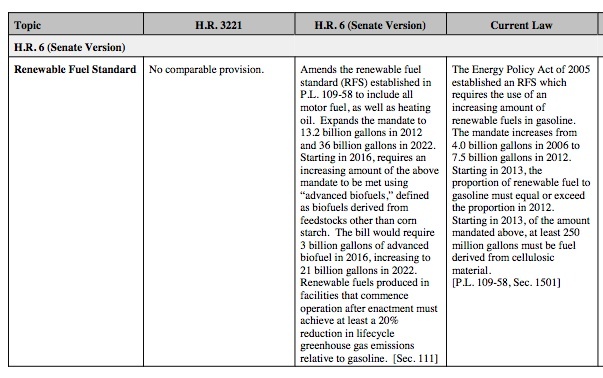 The CRS report stated that, “This report provides a side-by-side comparison of biofuels-related provisions in the House- and Senate-passed energy bills, H.R. 3221 and H.R. 6, respectively. H.R. 3221 (the New Direction for Energy Independence, National Security, and Consumer Protection Act and the Renewable Energy and Energy Conservation Tax Act of 2007) was approved by the House on August 4, 2007. The Senate approved its version of H.R. 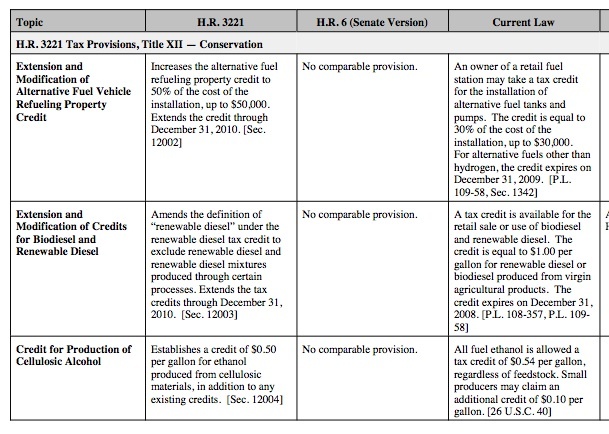 6 (the Renewable Fuels, Consumer Protection, and Energy Efficiency Act of 2007) on June 21, 2007. Both bills cover a wide range of energy topics with extensive attention to biofuels, including ethanol and biodiesel. For a more complete breakdown on tax issues, see this comparison on page 24 of the report; and for a more detailed look at the RFS provisions, see this comparison on page 27 of the CRS report. For a look at the legislative process regarding the energy legislation, see this excellent article (“Lawmakers Get Ready To Revisit Energy Bills”) by Steven Mufson, which was published in The Washington Post on September 5. And John M. Broder, writing in today’s New York Times reported that, “The prospect of a comprehensive energy package’s emerging from Congress this fall is rapidly receding, held up by technical hurdles and policy disputes between the House and the Senate and within the parties. “This summer, both houses passed major bills meant to promote energy efficiency and wean industry from fossil fuels. The bills have gaping differences that are supposed to be resolved in a conference committee. “Democratic leaders in both chambers have signaled that conference committee members are unlikely to be named until late October, at the earliest. Others suggested that leaders may try to resolve the differences in the bills without convening a conference, which would create other problems, including the threat of a Republican filibuster in the Senate. As an interesting and important side development on energy issues and agriculture, some have indicated that energy policy, not agricultural policy is an increasingly important variable that influences production decisions and market prices of program crops. For example, Associated Press writer Amy Lorentzen reported in an article from August 30 that, “Many in Iowa are pushing Congress to raise the amount of renewable fuel that must be used in the nation’s fuel supply. And there’s interest in what presidential candidates would do in 2010, when a 51-cent-per-gallon of ethanol tax break is up for review. As that reality plays out, international trading partners continue to take note. As has been highlighted before, a Dow Jones article from August 22 stated that, “In July, Brazil formally filed a plea at the World Trade Organization, charging the U.S. government has handed out billions of extra dollars to its hometown farmers in the grains and oilseed sectors from the years of 1999 to 2005, contrary to WTO rules. Just yesterday, Associated Press writer Bradley S. Klapper reported that “Brazil will ask the World Trade Organization for a formal investigation of U.S. farm subsidy programs, which it says includes payments for ethanol production, a senior Brazilian official said Wednesday. “The South American country, which has already won a series of WTO rulings over U.S. cotton subsidies, will make its request for an investigative panel soon, said Roberto Azevedo, the Brazilian Foreign Ministry’s trade chief. The AP article added that, “While most of the measures it questioned Washington about concerned farm produce, Brazil included in its complaint what it called ‘energy subsidies,’ which included tax exemptions on diesel fuel and gasoline. “Joe Glauber, the chief U.S. farm trade negotiator, disagreed. “Glauber declined to comment on what a WTO investigation would mean. “Azevedo said he was not sure when Brazil would formally ask the WTO to launch an investigation. The next meeting of the WTO’s dispute settlement body is Sept. 25 and new items must be added to the agenda by Thursday. However, Reuters news reported yesterday (via DTN, link requires subscription) that, “The government would present its request as early as next month but wanted to coordinate its presentation with Canada, which was preparing a similar case, Marega added. “Brazil will argue that the total of U.S. farm subsidy programs exceeds a $19.1 billion limit allowed under a WTO accord. “It will question Washington’s direct payments to farmers as well as counter-cyclical aid programs. Brasilia had questioned Washington on its ethanol subsidies last month but has not yet decided whether to include them in the request for a panel, Marega [Flavio Marega, head of trade disputes at Brazil’s foreign ministry] said.